Early Monday morning, the rover Curiosity landed on the Martian surface. Successfully navigating the “seven minutes of terror” during entry into the Mars atmosphere the explorer decelerated from 13,000 miles per hour to zero mph through a series of precisely timed maneuvers. In its final and most dramatic landing stage, the SUV-sized Curiosity was lowered gently by cables to rest its six wheels on the surface of Mars. 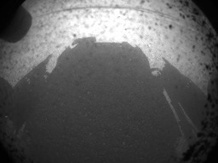 Fourteen minutes after landing the first images transmitted by high-frequency radio waves showed the shadow of the nuclear-powered rover on rocky Martian surface. Curiosity will continue to communicate with scientists at NASA’s Jet Propulsion Laboratory during the next two years as it explores the red planet’s environment to determine the possibility of microscopic life on Mars. Learn more about Curiosity and its mission here. 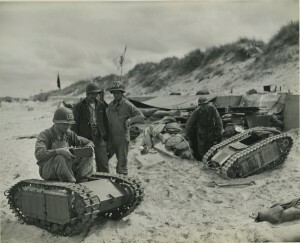 The use of remotely operated vehicles is linked to WWII when the “Goliath” tracked mine was developed for use beginning in 1942. Goliath operators used a joystick control box connected by 2,000 yards of wire to steer the battery powered device. Carrying over 200 pounds of high explosives the device was intended for one-time use including destroying tanks, disrupting troop formations, and demolishing structures. Slow moving and highly visible Goliath’s command cables were often severed and its thin armor provided minimal protection during battle. Despite its limited success, technology used to develop the Goliath helped to lay the foundation for remotely operated vehicles like the Mars rover Curiosity. Learn more about robotics here.